[L-R] Dr Trudy Ambler, Dr Marina Harvey, The Hon Phillip Ruddock MP and Dr Jayde Cahir. 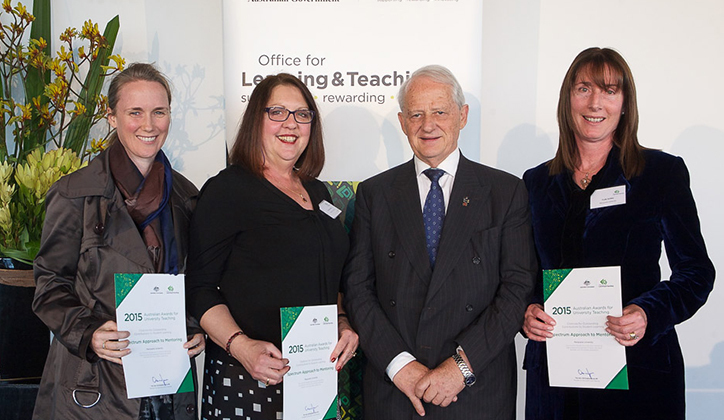 Congratulations to Dr Marina Harvey, Dr Trudy Ambler and Dr Jayde Cahir on receiving 2015 Citations for Outstanding Contributions to Student Learning, as part of the Australian Awards for University Teaching. The awards, announced last week, are administered by the Office for Learning and Teaching, and recognise the country’s best educators. Their Citation was awarded for research into the development of a new model of mentoring, the Spectrum Approach to Mentoring, which provides a framework of scholarly, flexible and innovative mentoring that enhances the professional learning of higher education teachers and the student experience. Deputy Vice-Chancellor (Academic), Professor John Simons says he is thrilled with the Citations. Dr Marina Harvey, commenting on behalf of her colleagues, says the Citation is one more indicator of the quality of the learning and teaching research that is undertaken at Macquarie. Learn more about the Spectrum Approach to Mentoring.